Alarms are blaring in Basingstoke. Michaella’s emerges from her duvet. 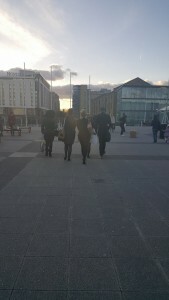 Basingstoke Texts Four Marks…Ellie’s up and waiting. 6.30am. Amy rises with the dawn birds in Alton. FB group message. Bordon and Aldershot notified, the complete team is up and raring to go. This year we wanted to improve our Pedicure offers, decide and book Amy and Ellie’s advanced beauty services, decide on whether to buy revolutionary new Shellac machines and for our nail technicians to meet fellow professionals and international nail celebrities. Sunday and the traffic….all…..the…..way….so slow….plodding through….town….2 hours…..finally there…..11ish already. Car parked, VIP tags printed, maps in hand….ready to go. Day one….Over before it began. Toooooo busy and understaffed. No space in lounges to sit and talk, no space anywhere on the exhibition hall to connect/see demonstrations. Workshops that we were booked for either badly run or admin mistakes from company meant we couldn’t even go. What a disappointment this would be for any young person looking to start a career in beauty. The team salvaged all they can and had enough information to make progress on Day Two. I start the day in Chris fashion by locking all his worldly possessions in his sisters flat (and couldn’t get them back until the following Saturday) But Amy, Chris and Inga make up for it for the rest of the day. Much quieter and more space (mental and physical) to get things done. Shellac New Lamps brought, CND convinced the team of the technology behind the new LED lights and that it brought overall improvements to the service. Shellac is a much loved aspect of our operation and we couldn’t introduce changes if we were in any way unsure. Ellie’s next 3 external courses are decided upon and upwards of one thousand spent on her personal extension eyelash extensions course with industry leader Lash Perfect in their Lash Bar in central London (link). Booked in for the end of March and available in both our salons soon after. With Farrah’s advice ringing in our ears, we decided on new pedicure bowls with recyclable disposable liners, to take Health and Safety to a new level. New fizzy surprises and spa products will add a new dimension to our already excellent pedicure options. 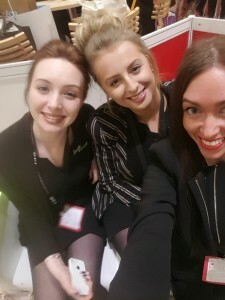 Inga, Michaella and Amy buzzed with excitement trialling nail products and comparing different brushes/powders/nail art. We plan to offer affordable show/competition nails this summer and training is set to make sure we are ahead of the latest fashion trends. Our nail techs are artists first, crafts(wo)men second and share such a passion for the service we provide to you. 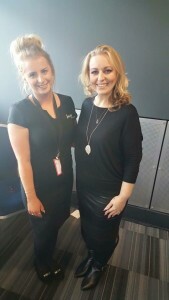 The whole experience ends in the perfect way, as Amy bumps into one of her idols in the nail industry Julie Lee. Everyone has a good chat about the industry, our respective businesses and the show. Julie Lee praises Amy on all she has achieved over the past couple of years and gives some amazing and inspirational words of advice as well. As two manic days (normally our rest days) draw to an end. We feel refreshed, revitalised and ready to keep pushing improvements through to all our clients without pushing up prices.